This is a great recipe! Make a cute little sandwich that your hamster will love. Take a small piece of deli bread and spread with peanut butter. Place one or two thin slices of carrots (or other vegetable), then place one or two Cheerios on top. Place another small piece of deli bread on top to make a little sandwich. Give this to your hamster. 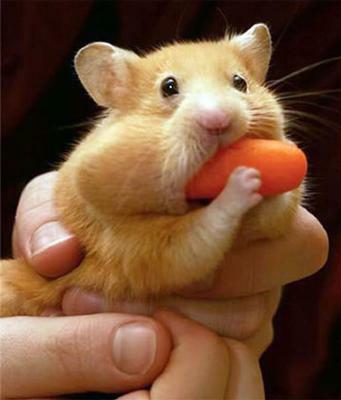 It should be just the right size for your hamster to hold and eat. You can even have a tea party with your hamster. That is the cutest hamster!!! Looks like he loves it. Will this recipe work for gerbils,too?